Day 1 of operations at the Mahikeng branch brought with it a sunny and exciting day for all of us as it was the first day meeting one another, from staff to volunteers and learners. 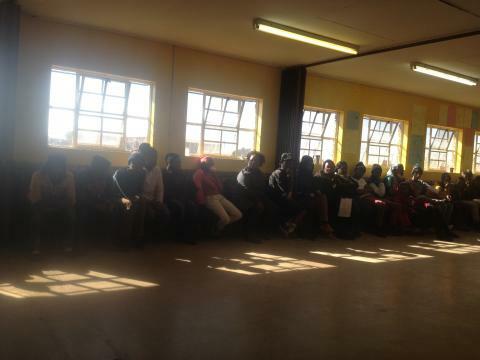 After three weeks of intensive recruiting learners and tutors, tutoring session kicked off on Saturday the 15th of August 2015 at the Danville Secondary School main hall where the branch is officially based.All 52 Learners with 12 volunteers gathered at the new Ikamvayouth branch in Mahikeng at exactly 08h30amto experience the first ever tutoring session ontheir home soil.Seated in a circle they were waiting for the Programme Coordinator to explain to them what the day would entail. 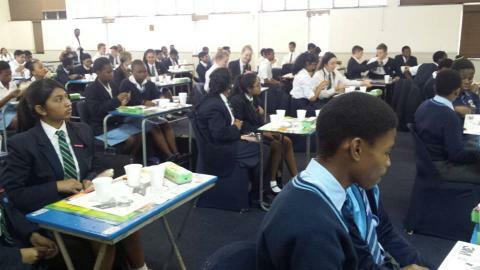 Before that, learners and tutors introduced themselves as it was the first time meeting and interacting with each other. 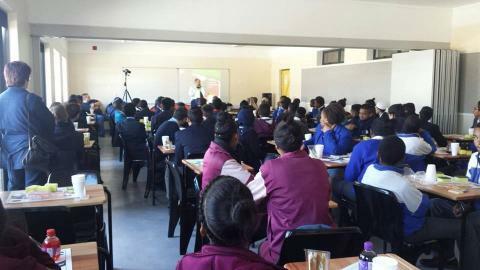 The most number of learners who attended the program came from Setumo High School and Danville Secondary School.As this is a program – a first for IkamvaYouth -and not a fully fleshed branch with grades 9 – 12, IY’s Mahikeng branch only caters for grade 10 learners from nearby schools and commitment is highly expected. This enables us to create an impact that allows them to improve on their academics and lives for the better.Like our IY model indicates, learners are to be seated in groups of 5 with 1 tutor in a table assisting them with the challenges they are facing in their school subjects. Lots of discussions were made and lots of laughter was shared on the day.We are really grateful to our host school for allowing us to use their space. The Principal and staff of Danville Secondary School have been more than welcoming. We are humbled by the warmth and cooperation received from the various community based stakeholders and parents who came in accompanying their children. Although the branch has not as yet been launched, the ball is officially rolling. It was very challenging for me especially because I am not used to standing and speaking in front of a huge crowd. I did not know how to first approach them because naturally I am a shy person, but as the day progressed, I was fine and had lots of fun. It was quite interesting and fun. I cannot wait for more sessions to come. The day was good but a little bit challenging especially because I had to remember what I had done years back in my school subjects. However, I really appreciate the fact that these learners take initiative and take the time to explain to us what they are finding challenging. I appreciate what Ikamvayouth is doing for us. 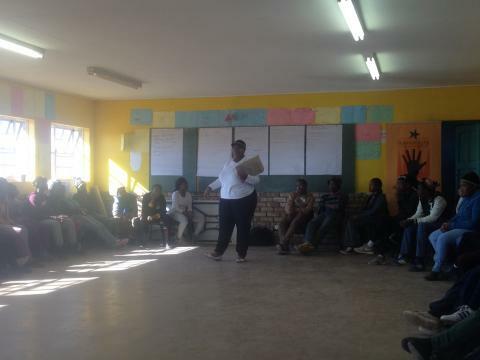 The program keeps us away from the streets and helps us to focus more on our academics. 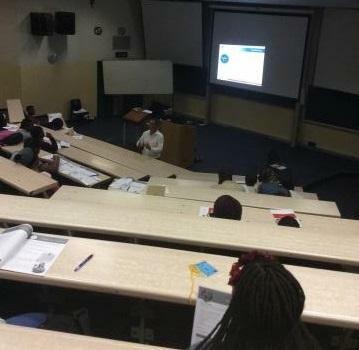 I really learnt a lot on my first day. The tutors were also friendly, and it made me interact with them better and understand better. I had lots of fun learning and meeting up with my fellow ikamvanites. Watch the space for more exciting developments! Ikageng branch was honoured to have visitors from Department of High Education and Training Khetha. 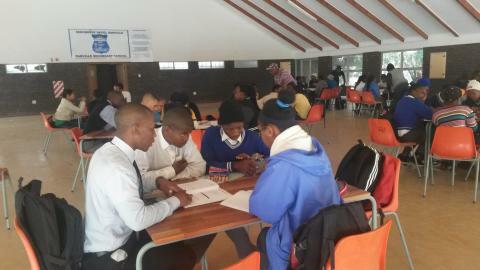 The aim of the day was to inform our learners about the different programmes that are offered from Universities, University of Technology and TVET Colleges nationally.With this in mind they encouraged the grade 12 learners to apply and submit their applications as most tertiary institutions are soon to be closing in August, whilst also encouraging the grade 11’s to work very hard and take note that most institution required grade 11 term 4 results for conditional acceptance into courses that learners show interest in and apply for. 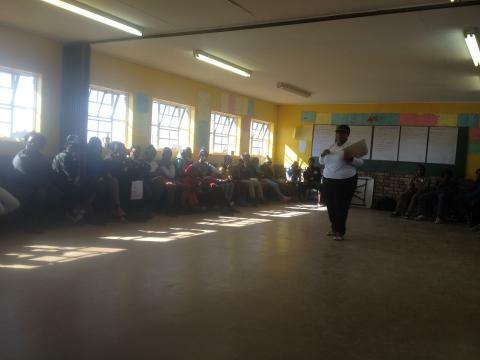 The information session had two facilitators from DHET Khetha, Segopotso and Harriet who thoroughly explained the background and the main focus of Khetha, a department formed by Department of Higher Education and Training that deals with offering career guidance support. Khetha is career development servicehelpline which provides free career guidance support and information and advises for both youth and adults in need of such. The main objective of Khetha is to empower all South Africans in making informed career decisions and guiding them through processes that will results in positive career outcomes. Further into the session, Harriet explained the difference between Universities, University of Technology and TVET Colleges, the various qualifications that are offered from different institutions and things that learner’s need to know before deciding their career path. She further went into details about how the different subject choice s influence and impact on a learner’s professional life. 2.The world of work– Understanding and researching about the different companies that one is interested to work for, by visiting their web site more frequently and aligning yourself to the different opportunities that they are offering . She further notified the learners about the various qualification that FET Colleges offers currently known as TVET College which are NCV( National Certificates Vocational) and to access these one would need to pass atleast Grade 9 to enrol into level 2.The requirements for Universities and Universities of Technology are slightly different, with these one would need to pass their grade 12 with a Bachelor or Diploma pass should they wish to enrol at these, they offer various programmes and also various qualifications which include Diploma, Degree, Honours, Masters & Doctorate qualifications. 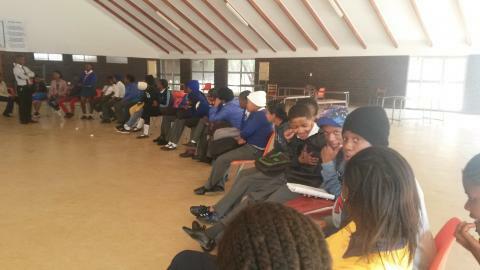 Upon conclusion, they informed the learners and reminded them that Khetha gives the public access to a social media platform, email and telephone advisory service where they can get career information and they can send an sms, ‘please call me’ or even an email to Khetha helpline and a professional career advisor will assistant them with the relevant information. Ikamvanites where overwhelmed with the fruitful career information workshop and everyone was given a chance to ask questions, Segopotso and Harriet were more than welcome to answer each and every question. Ikamvanite are now ready to make the right choices!!! Thanks a lot to the Department of Higher Education and Training. 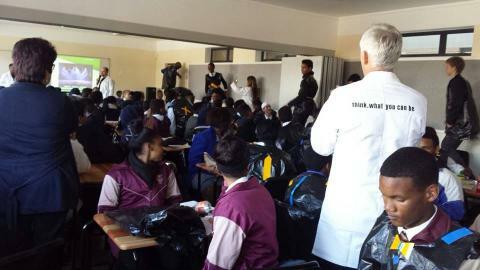 On the afternoon of the 18th of August, 26 Ikamvanites in grades 9 and 10, made their way to Protea Heights Academy in Brackenfell, to the much anticipated HIP2B2 Innovation Challenge Information Event. The 26 young innovators arrived at the venue and there was quite a tangible presence of excitement in the atmosphere as they got to mingle with other participants from several other schools before the event commenced. Right when the meet and greet was getting more and more fun, they had to enter the venue and the information event begun. The young innovators were taken through the history of the innovation challenge, some of the bright ideas that past participants came up with, what it means to take part in the innovation challenge and mostly, how fun it is to be part of something like the innovation challenge. Next, they had to complete 3 challenges in a space of 1 hour and 30 minutes. 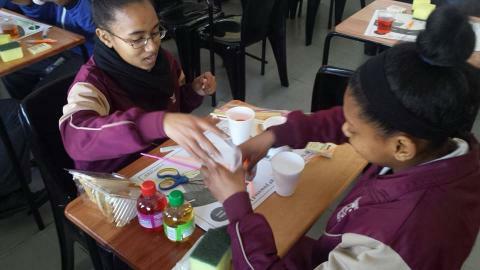 In the first challenge they had to make a working water distribution system with 3 paper cups, straws, a sponge, an envelope and of course some water. This was quite a tricky and messy challenge for all the participants but there was a brilliant execution of ideas in the room and it just shows that these young minds are not afraid of a challenge. 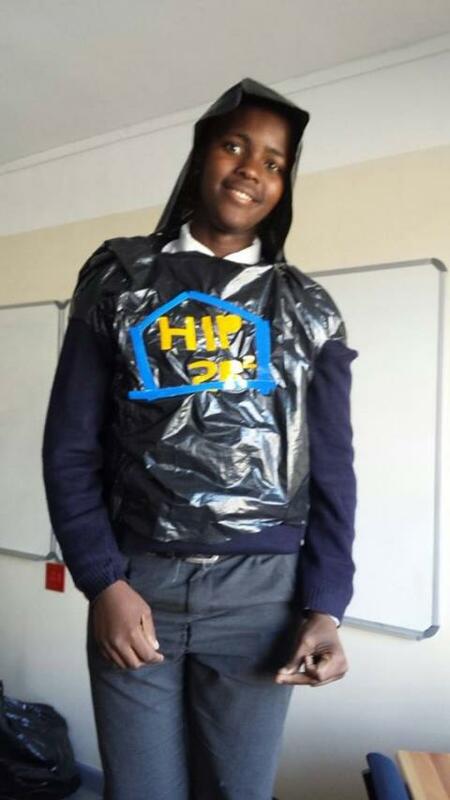 For the second challenge they had to design a reflector jacket for teenagers that walk during the night, using black bags, tape and several other material. Just as the science was impressive, creativity also took over with some jackets looking like they came straight out of a fashion week runway. Innovation took up its definition in this challenge. For the third and final challenge, the participants were given a piece of paper with a whole lot of shapes and they had to identify and count all the triangles that appeared on the paper. As we live in a fast paced era, this challenge required a sharp eye coupled with quick thinking and some participants were remarkably faster than others. THE BEST OF LUCK TO THESE YOUNG INNOVATORS!